The NFL is increasingly becoming a young man’s game. Back in 2006, 10-plus year veterans played a total of 105,771 snaps over the course of the season, a figure which dropped to 85,012 snaps by the end of the 2012 season and fell even further to 67,596 snaps at the close of the 2018 campaign. The influx of young, promising talents like Lamar Jackson, Patrick Mahomes, Baker Mayfield, Eddie Jackson, Chris Jones and Derwin James – just to name a few – puts the league in a very capable hands as we look towards the future, but the performances of the younger players shouldn’t take away from the fact that there are still seasoned veterans out there who performed to a very high level in 2018. Below is a list of the 10 highest-graded 10-plus year veterans, with some honorable mentions to boot. In his 18th NFL season, there’s not much more Drew Brees could have done to cement his name among the very best to ever play the position, as his stellar play earned the highest single-season overall grade of his career at 94.7. Long amongst the most accurate quarterbacks in the league, Brees ended the 2018 campaign with an adjusted completion percentage of 82.2%, which is not only the best mark of his career, it’s the best mark ever recorded by a quarterback in a single season. 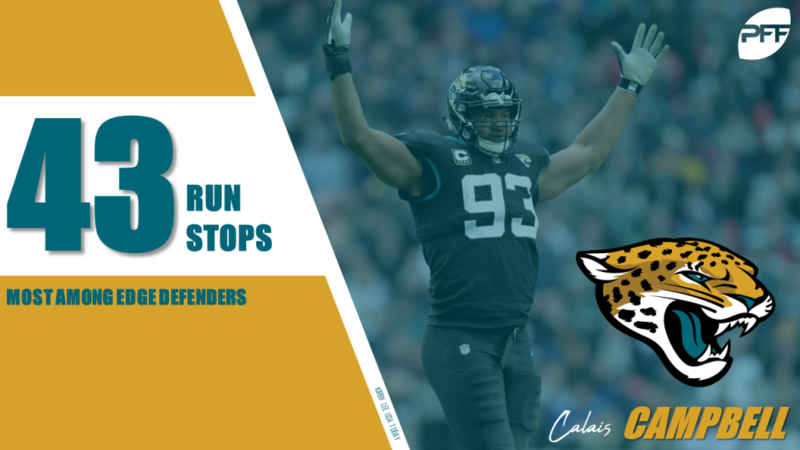 Over the latter stages of his 11-year NFL career, Calais Campbell has blossomed into one of the very best players at his position, notably finishing among the top three in overall grade among his peers in each of the last three seasons. His latest showing – which earned a position-leading 91.1 overall grade – was the second-best single-season mark of his career, and that was all down to his remarkable production against the run, where he tallied a staggering 43 run stops on the year – the most ever recorded by an edge defender in a single season. The 15th-year signal-caller ended the 2018 season with an elite overall grade of 90.8, the fourth-best grade among quarterbacks this year and Rivers’ best single-season grade since 2010. Philip Rivers was superb from a clean pocket this year, completing 257 of his 352 attempts for 3090 yards, 24 touchdowns and just six interceptions, which generated a passer rating of 115.1 – sixth-best among qualifying quarterbacks. Another year, another elite overall grade for the 41-year-old New England Patriots quarterback, Tom Brady. While the 2018 chapter of Brady’s career wasn’t quite up to the standard of years past, Brady still ended the season with 26 big-time throws next to his name and a big-time throw percentage of 4.6%, which tied for the 13th-best rate among quarterbacks. 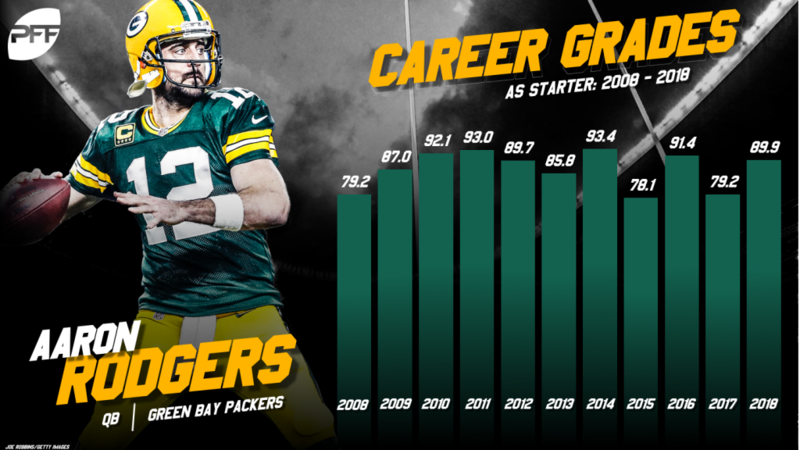 The Packers’ record may not show it, but Aaron Rodgers played some of the best football of his career in 2018. In his 14th NFL season, Rodgers was one of the league’s best quarterbacks at avoiding turnover-worthy plays, probably owing to the fact that he threw the ball away a staggering 59 times on 597 attempts, which is by far the most ever recorded by a quarterback in the PFF era. Nevertheless, Rodgers finished the 2018 season with a turnover-worthy play percentage of just 1.2% – the best rate among quarterbacks with at least 100 dropbacks. The 14th-year edge defender produced the highest-graded season of his career in 2018 and was a force as a pass-rusher, where he produced 38 total pressures from his 238 pass-rushing snaps for a pressure percentage of 16.9% – the fifth-highest rate among edge defenders with at least 100 pass-rushing snaps. Not only that, Alexander ended the season ranked 13th among players at the position with 38 total defensive stops, and he missed just three tackles on his 61 attempts throughout the year. 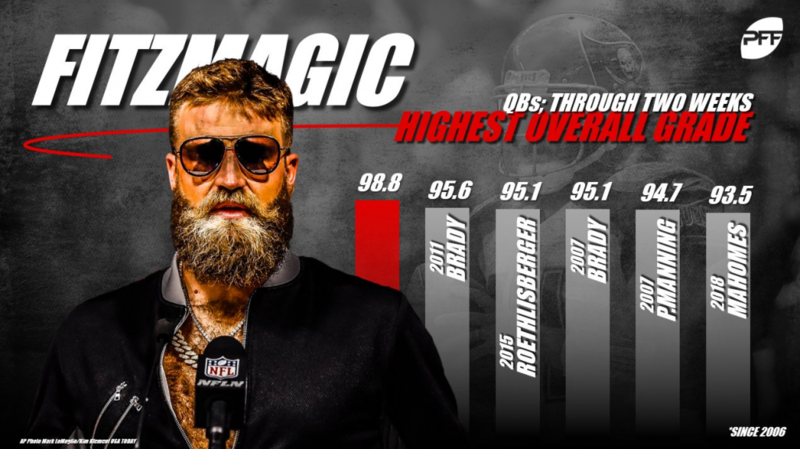 To say he regressed to the mean towards the latter end of the 2018 campaign would be an understatement, but the first few weeks of Ryan Fitzpatrick‘s 14th season were nothing short of magical. His 98.8 overall grade over his first two games are still the highest we’ve ever seen over an opening two-game stretch, while his 282 yards from deep passes (passes of 20-plus yards downfield) over that span was over 40 more passing yards than the next closest quarterback. At the same time, he still managed 15 turnover-worthy plays in under half a season (Eli Manning led the league with 25), and he’ll end the season with a turnover-worthy play percentage of 6.1% – the third-highest rate among quarterbacks with at least 100 dropbacks. The highs were highs, but the lows were low. In his 11th year in the league, Matt Ryan put forth yet another impressive season and ended the campaign ranked 11th among quarterbacks with an 84.3 overall grade, the fifth-highest grade of his career. Through 17 weeks, Ryan was dominant from a clean pocket, completing 322 of 424 attempts for 3628 yards, 27 touchdowns, and only three interceptions – generating a 116.6 passer rating that was good for fifth among signal-callers. On a list dominated by offensive legends, 10th-year cornerback Jason McCourty‘s 2018 performance sees him as the third defensive player on this list of top-performing veterans. His 83.1 overall grade is good for sixth among 121 qualifying cornerbacks this year, and his coverage grade of 84.1 is by far and away a career high. Through 17 weeks, McCourty racked up 15 defensive stops while in coverage, which was tied for the ninth-most among cornerbacks. Words can’t do justice to how good the now-37-year-old has been throughout his 13-year NFL career. Through 17 weeks of the 2018 campaign, Whitworth’s overall grade of 82.7 is good for fifth among all offensive tackles in the NFL, and it marks the 10th year of his career with an overall grade north of 80.0. As always, Whitworth was as solid as they come in pass protection, where he allowed 33 total pressures from 601 pass-blocking snaps.